Ugh…even the possibility of failing makes most of us cringe. We are supposed to be smart, fearless, skillful at EVERYTHING we do and many things we don’t do, visionary…the list goes on and on, doesn’t it? In other words, we are supposed to be perfect! Wow, what a trap that is. When we focus on being perfect, we deny ourselves opportunities to try things that might be useful, fun, or help us grow. Malcolm Gladwell tells us that to become competent at a new skill we need approximately 10,000 hours of practice – and most of our early results won’t be pretty. Most authors know they will receive many rejections before someone will agree to publish their book. So each rejection is a stepping stone that brings them closer to the “yes” they are seeking. 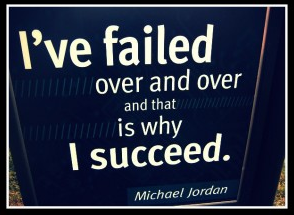 Some “failures” don’t even reflect our skills or effort. Job promotions, hirings, elections, and admissions are often based on factors that are not under our control and may even be somewhat arbitrary. That doesn’t keep us from feeling like a failure when we are not chosen. It seems that failure is just going to be a part of our lives. The fear of failing keeps us from doing many things that we would like to try. So is there a way to look at failures that takes the sting out of them and gives us more freedom in our lives? Although many coaches stress the “gift” in each failure, seeing the benefit of failing may be pretty difficult as we look through the mud we have fallen in or the egg on our face. Surprisingly, the best thing to do from the start is to really feel that mud or the egg on our face. What do we notice when we allow ourselves some time to be in the experience of the “failure,” rather than trying not to feel any of it? Does our chest get tight? Do we feel as if we’re made of stone? Does it seem as if we’re locked in a dungeon? By allowing ourselves to feel what we feel, knowing that it is just an experience that, like all other experiences, will pass, we usually find that the sensation or imagery shifts. The tightness eases up. Our body begins to feel movable again. The dungeon might morph into a tunnel with a light at the end. Just being with our experience allows our inner strengths to show us that our experience is just a temporary feeling and that there are other ways to see this. Similarly, we can play with the perspective we have taken – was it a failure, or was it an experiment that yielded an unexpected result? As Thomas Edison said in inventing the lightbulb, “I have not failed. I’ve just found 10,000 ways that won’t work.” There are many creative ways to change our perspective, from looking at the situation from the point of view of someone we admire (Mother Theresa, Nelson Mandela, etc.) to taking on the perspective of an animal. How would your family dog look at this “failure?” How about a great white shark? One of my favorite perspectives is that of a child – children fail at most things they initially try, yet they keep trying because the goal is just so enticing. None of us would be walking if we had given up after just one failure! After exploring a few other perspectives, we can ask ourselves what we have learned about this “failure” and how we want to proceed. Even though the outcome wasn’t what we had hoped for, there was a reason why we tried what we tried. There was a project we wanted to complete, a connection with a person we wanted to establish, a new process we wanted to introduce. Armed with a new, more empowering perspective and the learning from our last “experiment,” we can move forward and try again. It might be toward another “failure” or toward a result that we might define as “success.” Either way, we will be learning, growing, and giving others permission to try as well. The world can’t help but be better because of our courage and vision. This entry was posted in effective communication in healthcare, honesty in medical care, mindfulness, physician coach, physician coaching, physician communication, physician fulfillment, physician work life balance and tagged Physician coaching. Bookmark the permalink.